It’s no surprise to business leaders that engaged employees make better team members. Increasingly, people want to work for companies and organizations that give back to the community. Businesses that implement a workplace volunteer program give employees a chance to meet like-minded professionals, develop new skills and find meaning and value in helping their neighbors in need. Not to mention the plethora of social and mental health benefits employees gain by taking part in meaningful volunteer activities. For some companies, employee engagement gets a boost with larger-scale volunteer initiatives – from quarterly service days to month-long volunteer programs. 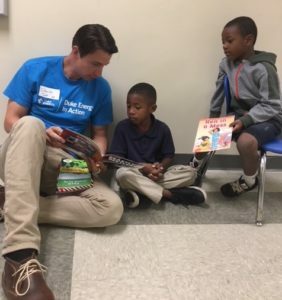 With a passion for giving back to the communities they serve, Duke Energy and TIAA are two leading companies engaging their employees through unique volunteer initiatives. For more than a century, Duke Energy has harnessed the power of its employees to make a difference in the community. 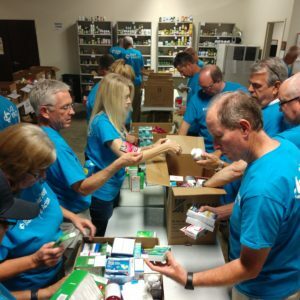 The company’s passion for giving back through service is a significant part of its mission as it serves communities in its seven-state footprint through charitable giving and employee volunteerism. As part of a long-standing partnership, United Way coordinates local community service projects for the company during the annual initiative Duke Energy In Action Month. “United Way’s knowledge of community needs and expertise for executing impactful volunteer engagements makes them an excellent partner for this initiative as we create enthusiasm and engagement for our employees, and lasting impact for our community,” said Sarah Degnan, lead community affairs consultant at Duke Energy. Throughout the month-long volunteer initiative, Duke Energy team members volunteer at a diverse group of nonprofit partners in communities including Charlotte. In the past, employees have served as classroom helpers and breakfast buddies at Renaissance West STEAM Academy and assisted in the mother’s room at Howard Levine Child Development Center in the Renaissance neighborhood. Employees also look forward to returning each year to the Carolina Raptor Center to complete projects like repainting bird enclosures, sprucing up habitats and providing general site cleanup. In 2018, the initiative collectively involved more than 2,800 employee volunteers, 12,000 service hours and 182 different projects across the communities Duke Energy serves. In addition to Duke Energy In Action Month projects, employees work with United Way throughout the year to coordinate volunteer projects and team-building activities. Employees give their time for projects across Charlotte including sorting through donated clothing at Crisis Assistance Ministry, preparing books for distribution at Promising Pages, helping with facilities management at the Humane Society of Charlotte and assembling literacy kits and snack packs for additional United Way partners. TIAA’s drive to have a positive impact in communities and on those who make a difference in the lives of others has been a core commitment for more than 100 years. From volunteer efforts in local schools to responsible investing across its wide footprint, TIAA knows corporate social responsibility is about doing what is right for colleagues, clients and communities. To mark its centennial in 2018, TIAA celebrated by giving back through its 100 Days of Difference. The campaign addressed education, hunger and education needs in communities across the nation where the company has a presence, including Charlotte. 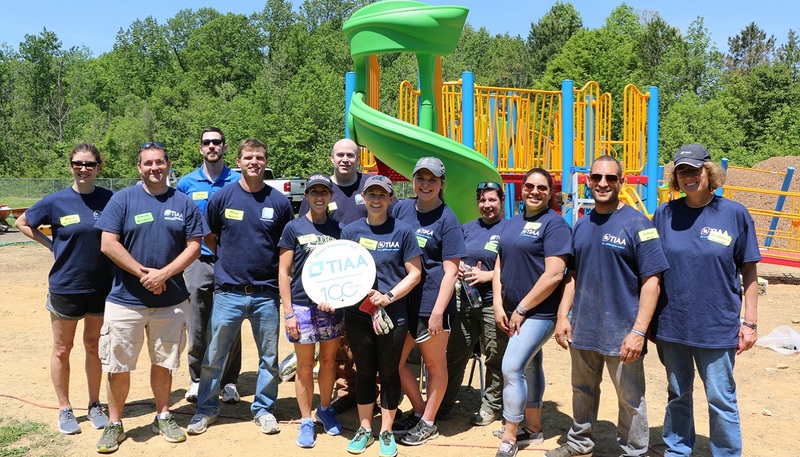 Jarian Kerekes, TIAA’s senior director of corporate social responsibility, said the company and employee volunteers were humbled by the work and impact that took place in partnership with United Way during the 100 Days of Difference. 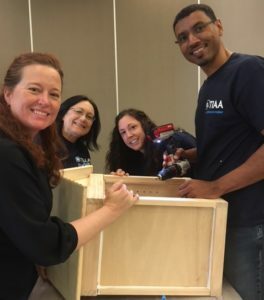 From building more than 60 tiny libraries around Charlotte, packing about 2,400 hygiene kits for local distribution and funding a playground build at Mallard Creek Elementary, TIAA employees were busy volunteering to improve lives in their own backyard. During the campaign, the company also held a hunger luncheon to educate employees and build awareness around poverty and food insecurity in Charlotte. TIAA’s 100 Days of Difference collectively impacted more than 650,000 lives across the nation. Of the 120-plus projects in Charlotte during the 100-day period, 35 directly supported United Way partner agencies. Beyond this unique campaign, TIAA’s year-round partnership with United Way provides sponsorship, event and volunteer opportunities for employees to give back throughout the year.